99 members of UB Faculty and Staff were recognized at the President’s Annual End of Year Social, held in December at the UB Central Campus in Belmopan, for service to UB up to 2017. 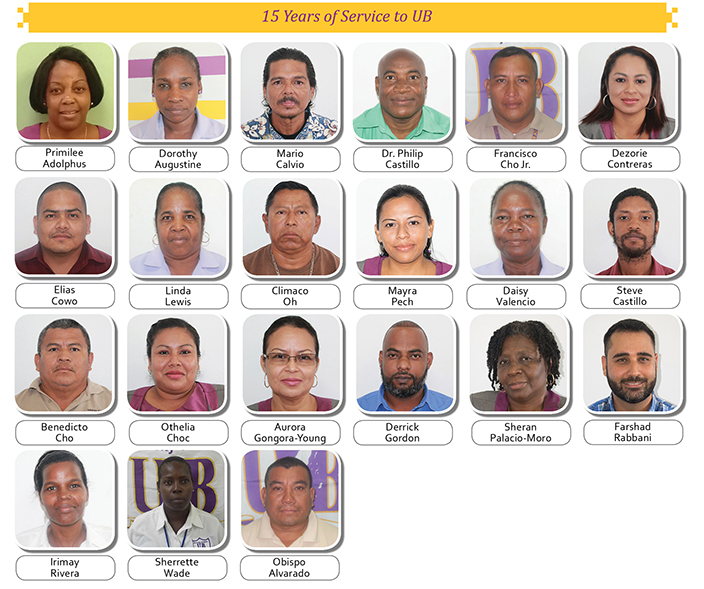 49 persons completed 5 years of service, 29 persons achieved 10 years of service and 21 persons made it to 15 years of service to UB. Their dedication and commitment to the advancement of UB is appreciated. Also their contribution over the years has helped to keep UB sustainable. “We applaud you for the countless hours you have put in here at UB. We also congratulate you on achievements in your personal life over the 5, 10 and 15 years you have been here at UB,” says President Sankat. As we execute on the transformational Plan 2022, the support of all UB Faculty and Staff will be paramount in achieving the goals set. Together we will achieve. Becoming the true National University that provides relevant, state of the art education to our students, will require us to be very creative and innovative in our approach. To have made it a place of work for such a long period of time requires you to have most of the following traits; positive attitude towards your work, adhering to UB’s rules and expectations, going beyond the call of duty, taking on additional tasks to help support your department, the University, or our students, great team players, fun to be around, and the list goes on. President Sankat also offered Certificates of appreciation to partners who assisted with the First President’s All Inclusive Endowment Fete.